Four handguns were among the items Albany police seized at an Salem address. When it comes to gun stories in the news, one question of considerable interest is rarely addressed: Exactly how did the felons in the stories obtain the firearms they are charged with unlawfully possessing? The presumption behind the laws on background checks is that they have a purpose, namely to keep guns out of the wrong hands including those of felons. How valid is that presumption in the real world? Not at all, judging by the news. On Monday, the Albany police announced the results of two drug crime investigations over the past week. They made eight arrests and seized, among other things, six guns. In one of the cases, three people were stopped in a car on an Albany street. Two were charged with being felons in possession of a firearm. It’s safe to assume they had the alleged guns without having gone through the required background check. So how did they get them? 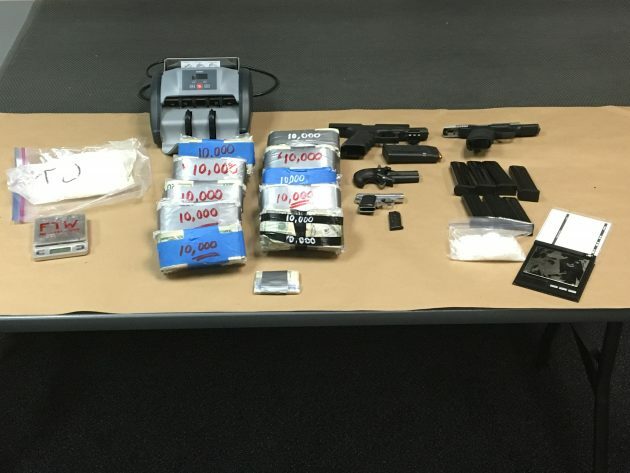 In another of the cases, the Albany police raided an address in Salem, where they seized methamphetamine along with more than $100,000 in cash and four handguns. The police sent along a photo of some of the items seized, including the four guns. No one had yet been charged in that case by the time the police issued their press release Monday morning. But again, how did the guns find their way to that place? It’s important to point out, in passing, that nobody shot anybody in this story, so the guns are not the biggest part of the news. And in theory having a weapon seems to make sense — for deterrence alone — if you’re going to deal with illegal drugs and store mountains of cash. Clearly we don’t want drug criminals to be armed to the teeth. They are assumed to be armed, though, which is why SWAT units help serve search warrants in these cases. Why are the guns any different than the meth? There are strict controls on meth and the components used to make it. Yet somehow, despite all this regulation, criminals somehow obtained pounds of it. Plain and simple, if a criminal wants any type of contraband, be it guns or drugs, they will get it. Rigid gun control does nothing but make it more difficult for the law abiding to acquire a firearm. The war on drugs has been an even bigger failure than the war on guns. It seems all these “wars” are destined to fail. Or maybe the guns were purchased lawfully before they became felons? @Hasso – Why not? People aren’t born ‘felons’, and you’re not a ‘felon’ until such time you are caught, charged and convicted of a crime. And while the law may say that someone who has been convicted of a felony is required to surrender their guns, how exactly is that law enforced? Is the now, felon’s house searched? Is there even a simple database search to see if there are guns registered in his/her name? But the simple fact is, there is a huge ‘black’ market for guns and the stricter the legal market becomes, the bigger the illegal market will get. IF they become felons, they are required BY LAW to give up their guns. @Bill – And BY LAW you’re not supposed to drink and drive, or text and drive or exceed the posted speed limit and people still do it all the time. People who break the law in the first place, aren’t going to worry about breaking the law in the second place, which is why proposed stricter gun laws are worthless. It’s like locking your door, it does nothing except keep honest people honest. I have no idea what your point is? By your logic, laws are useless, so why are you even worrying about it. My take –some laws, while good in intent, can only be enforced randomly or perhaps minimally. Here’s reality — enforcement effort will follow the greatest effort for the least effort. That’s nothing new. Another question for those advocating more gun control; why when OSP rejects a background check form is to a felony record, there is rarely any investigation or an arrest for attempting to make the purchase??? Criminals will always get guns and any way they can. More gun control laws only harm the innocent citizen and push a left wing agenda. How about stricter penalties for crimes committed with a gun and felon in possession ? They already have an additional FEDERAL charge for ANYBODY using a firearm in the commission of a crime. It’s just a matter of them enforcing it. Often, they drop that charge in a plea bargain process. Back in the 90’s hand gun deaths were becoming a thing. Treating it as a public health issue, rhe NIMH started doing some research. Ah well. You can guess that was unpopular with some people. So Congress effectively stopped it. So we are able still to make the arguments that nothing works or can work. Yeah Some Guy, it must just be hell on law abiding citizens to buy a gun. I guess I should feel sorry for you and the rest of the deprived citizens who collectively own over 300,000,000 guns in this country, but I don’t. WOW! A Socialist reading Fortune magazine. Way to stoke the fire, dude. The folks who seem convinced that Uncle Sam is mere moments from confiscating their guns love this stuff. Now you need to think about monetizing your website. Everyone else is making money on the misery of guns. It is high time you did the same. This may excite some. Could it be true? 1/2 of guns in ‘merica are owned by 3% of the pop. Snopes says so. Hmmmm. Sure changes to way I see things. Bunch of hoarders! Republicans want to punish criminals. Democrats want to create them. It makes for more state/federal jobs, with the benefits of additional “support staff” such as parole officers, prosecuting attorneys, public defenders, counselors to rehabilitate…….